Make deposits, withdrawals, transfers, account inquiries and other member transactions at over 5,000+ shared branches conveniently located near you through our partnership with the CO-OP Branch Network. One ATM Located Outside Of Branch And One ATM Located Nearby Cafeteria. ATM Located Outside Of Branch. This branch is in a secure facility and can only be accessed by an employee using a building pass. Transact Business With SDFCU at 5, 000+ Shared Branches. Access nearly 30,000 ATMs near you. 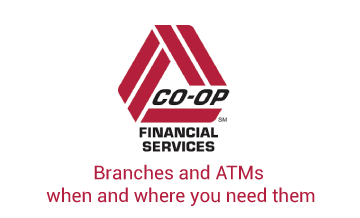 Make deposits, withdrawals, transfers, account inquiries and other member transactions at over 5,000+ shared branches conveniently located near you through our partnership with the CO-OP Branch Network.